Arugula is a year-round green in our garden. In the summer months, the leaves don't get big but the flavor is amazingly intense. At this time of year, the leaves are huge, and the flavor equally wonderful. We're now harvesting our winter arugula on a regular basis, and starting new seeds for spring. We especially love the arugula from Franchi Sementi, available at Seeds from Italy and Botanical Interests. This sandwich plays the strong, bitter flavor of arugula against gooey, sweet caramelized apples and sharp cheddar cheese. Use as much or little arugula as you please. Ours is so intense, a little goes a long way, but we still loaded our sandwiches up with several leaves and even included the stems. Peel and dice apples into 1/2" cubes. Melt butter in large skillet over medium. Add sugar and stir until sugar begins to melt, about 1 minute. Add apples and saute until brown and tender, and juices form, about 10 minutes. Remove from pan with a slotted spoon, leaving juices in the pan. Add cinnamon and nutmeg to juices in pan and mix well. Return pan to medium heat, then add bread slices. Brown well, then flip and repeat. While second side of bread is toasting in pan, place cheddar slices on two of the bread slices so the cheese will melt. When bread is browned, removed from pan. 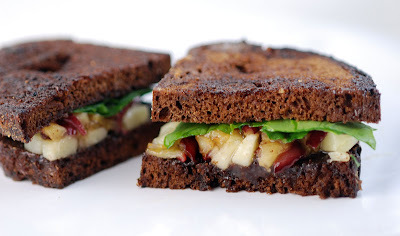 Add caramelized apples and arugula (3-4 per sandwich depending on how strong your arugula is), and assemble sandwiches. Eat while still warm. I love the idea of an apple melt, so good with aged cheddar! This is a totally unique idea, love it! I'm way drooling over that pumpernickel bread right now. I pulled out the bread maker before running off to work and threw in a batch of pumpernickel. Got Pacific Rose apples, Sharp Cheddar and Dandelion leaves (arugula wasn't avail.) on the way home and thought we'd have appetizers, because John doesn't do vegetarian. Well - a loaf, a wedge and three apples later he/we were too full for a 'real' dinner. BRAVO & thank you Robin for a great recipe that we kept eating and eating and eating! I think it would also make a stellar appetizer served open-faced and cut in little squares with the apples sliced. Apple is so versitile, it can be eaten alone, with spreads, in salads and sandwiches. Honestly I never thought it went in a sandwich really, but obviously it does. looks SO good! Does that ever look good! I love combination of the sharp cheddar with the sweetness of the apples (which is why I also have a slice or two of cheddar with apple pie). Another great and fantastic sandwich.